As a leading cybersecurity company from the region, CTM360 has shown continuous agility and innovation in developing and refining its portfolio of cybersecurity services. Through a cloud-based platform, CTM360 accounts for all variations of threats that originate in cyberspace without requiring any installations, access to infrastructure or prior information from organizations. “Our success hinges on providing true value to every member without gimmicks. The CTM360 service was developed with three core foundations in mind: agility, innovation and determination; this makes our team highly adaptable to our members. Without requiring any insight into their infrastructure or architecture, Team CTM360 can be deployed as an external SOC on the internet. We are a very results-oriented setup and our achievements in hunting and neutralizing threats on the internet have given CTM360 widespread recognition. 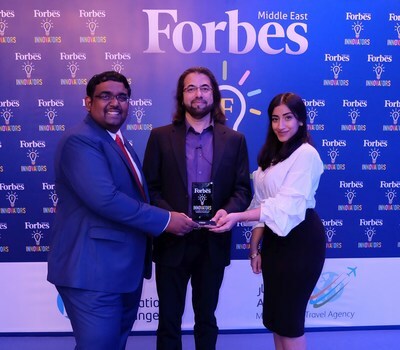 Ecstatic with this Forbes achievement,” stated Mirza Asrar Baig, founder & CEO of CTM360. As an ongoing subscription-based service, CTM360 enables companies to perform Cyber Threat Management outside the perimeter of the organization. This decentralized approach means the company can tackle cyber threats on a global scale, in any industry and any geography. “Our incident management, digital risk management and other portals are complemented by a strong technical backbone, which combine to provide one seamless service. A desire to build a world-class service is a key driver that has helped CTM360 rapidly scale up. We reside exclusively in cyberspace and our intention is to become the dedicated cybersecurity department of organizations, of all sizes in any industry or geography,” stated Arsalan Iqbal, Director for Growth & Strategy. This quarter has been a remarkable one for CTM360, with the company recipient of recognition not only from Forbes, but also being winners of Red Herring Asia (Manila) and Best Managed Detection & Response Provider at the Security Advisor awards. CTM360® is a subscription service offering 24 x 7 x 365 Cyber Threat Management for detecting and responding to cyber threats. Headquartered in the Kingdom of Bahrain, CTM360 specializes in offensive defense – a mentality that looks to neutralize and eliminate threats in infancy – and strives to strengthen a subscribed member’s security posture by making them a smaller target in cyberspace. CTM360 currently caters to 25 of the Top 50 Banks across the GCC, as well as entities in Oil & Gas, Healthcare, Sovereign Wealth Funds, Aviation and other sectors.